If I were a followed blogger, I’d have to apologize for the long silence. Some day! For now, it’s a good thing to have zero followers. Summer arrived, and I started filling my free moments with being outside, gardening, cookouts, trips to the lake and general summer fun and relaxation. I got re-inspired to return to our blog by an article I read recently in the Summer Made Easy Special Issue of Everyday Food Magazine called Bask Country about a tapas party with food prepared by Aran Goyoaga, a pastry chef, blogger and cookbook author, written by Jean Lear, photographed by John Kernick. I read the lines “She started blogging as a way to keep track of the baking she was doing at home….Soon her serene, light-filled aesthetic–captured by her photographs as well as her prose found a loyal readership.” Now, that is what I was thinking of when I started this blog. I immediately jumped up and grabbed my camera and my laptop. And then I encountered a bunch of boring computer and camera problems and had to save this post for another day. 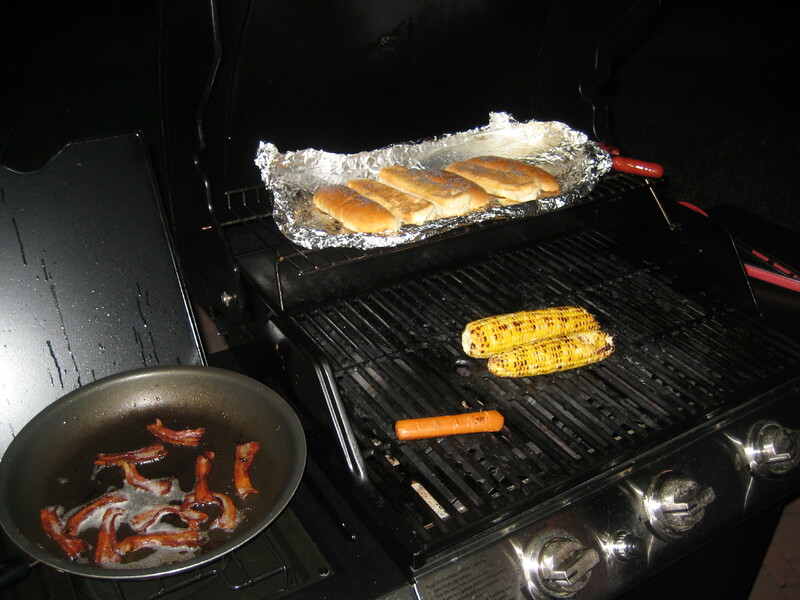 Problems solved… Here is my first attempt at recreating a close approximation of an authentic Chicago-style hotdog. First, I had a little shopping to do in order to top the dogs properly. 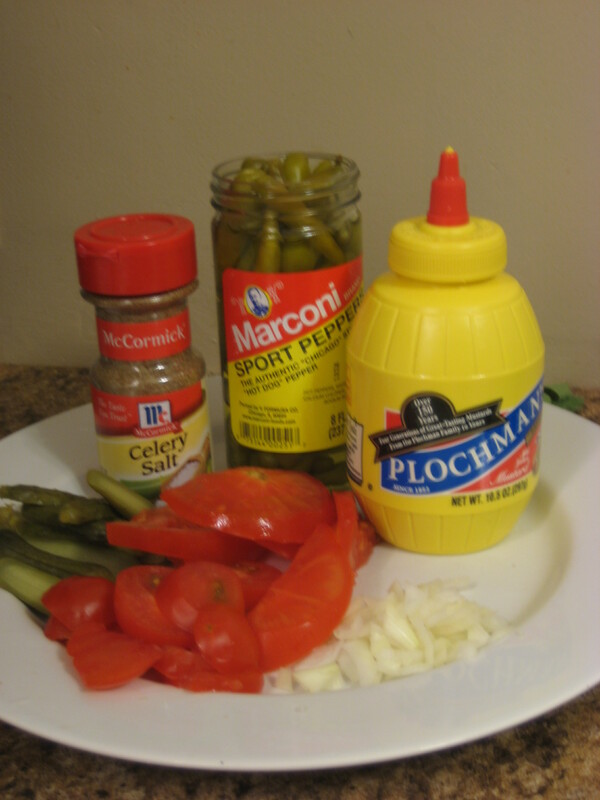 Chicago dogs come with sliced tomatoes, mustard, onions, a dill pickle spear, a funny little pepper called a Sport Pepper, and a sprinkling of celery salt on a poppy seed bun. 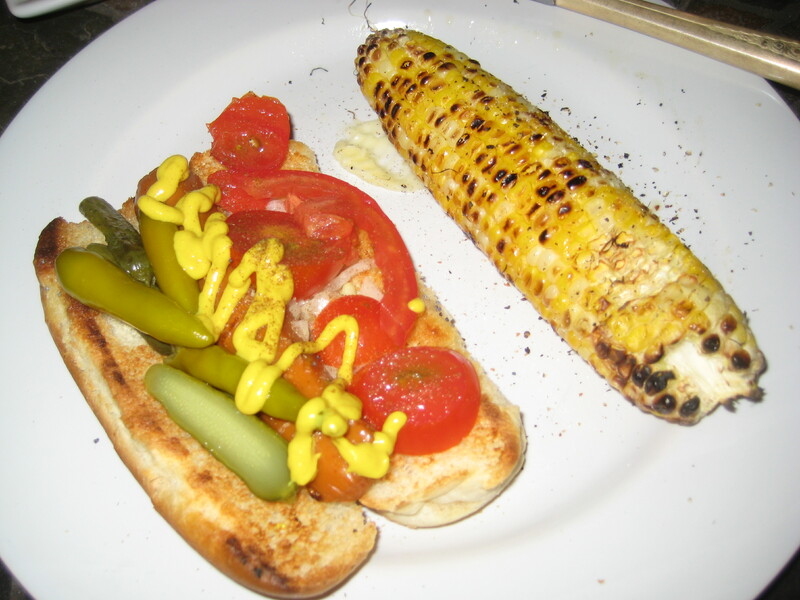 Its been a hot summer, so an advantage to the Chicago dog is that it can be made on the grill. I brushed the buns lightly with butter in order to help adhere poppy seeds to the top. The meat version, served with a side of grilled sweet corn, with butter, pepper and salt, of course, and a few strips of bacon, for good measure. The veggie version, is a close approximation of the classic chicago dog, except with with a vegetarian dog, and of course, all of the essential chicago dog fixings. 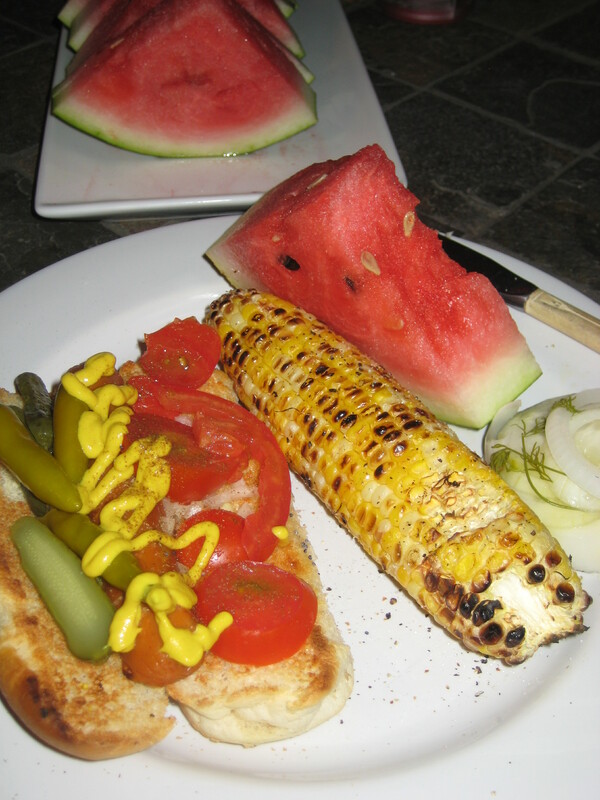 I enjoyed mine with a cob of grilled corn, a slice of watermelon and cukes & onions with dill, vinegar with salt, pepper. A tasty escape to the Windy City! 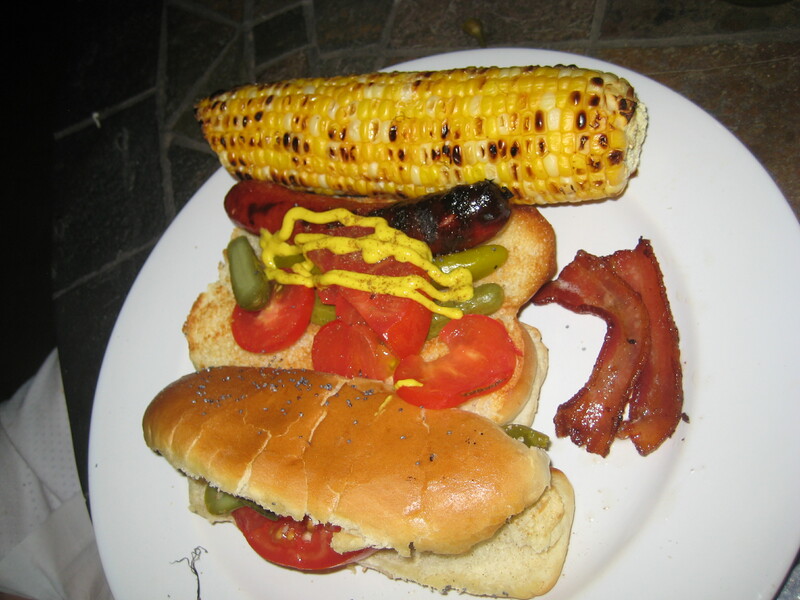 This entry was posted in Classic, Grill, Supper and tagged Celery Salt, Classic Chicago Dog, Hot Dog Bun, Mustard, Pickle Spear, Poppy Seeds, Tomato, Vegetarian Chicago Dog by Our Way to Eat. Bookmark the permalink.